As any parent knows, there is nothing better than knowing that your kids are happy. We have just experienced two amazing days of soccer. 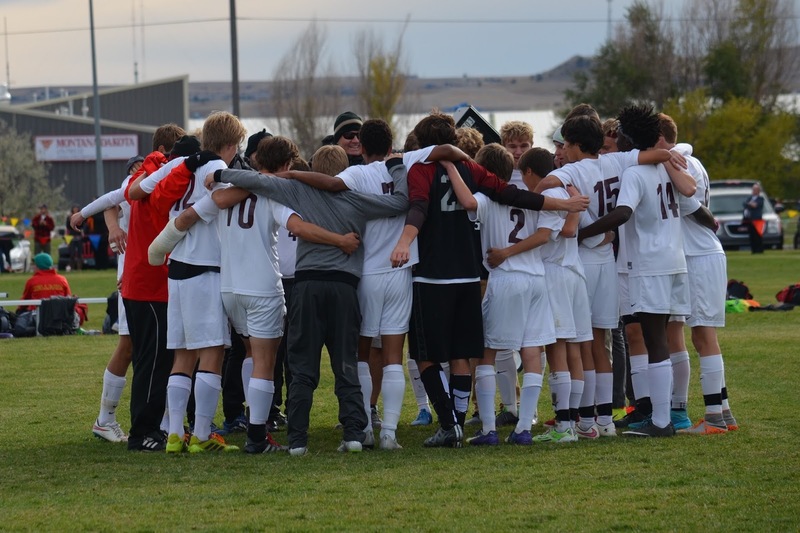 Both our high school teams (boys and girls) won their first two games in the State Championship Soccer Games. Teammates and families have draw even closer together than we have been all season. It has been fun, and we all are going into the final Championship games today with high aspirations and hopeful feelings. Sometimes I hate sports, because someone always has to lose. But, win or lose, nothing can take away the good that happens along the way. I hope you have a wonderful weekend - and that our teams do too! How on earth can it be the end of October already?? There have been some signs... the days are definitely a lot shorter and the stores are stocked with not just Halloween and Thanksgiving things - but Christmas items have made their appearance as well. Mother Nature has not helped me to keep track of the calendar though - and I am not complaining a bit! We have had an incredibly beautiful fall, with many warm and sunny days and most of the leaves are still on the trees. Halloween can be a frightfully cold time of year here. I can remember any number of years when it has been below freezing or subzero. This year though, kids might actually get to trick-or-treat without heavy coats over their costumes! I am been taking a bit of a leave of absence from Facebook, the blogging world, and even reading anything online, as I have been trying to get caught up with life tasks. 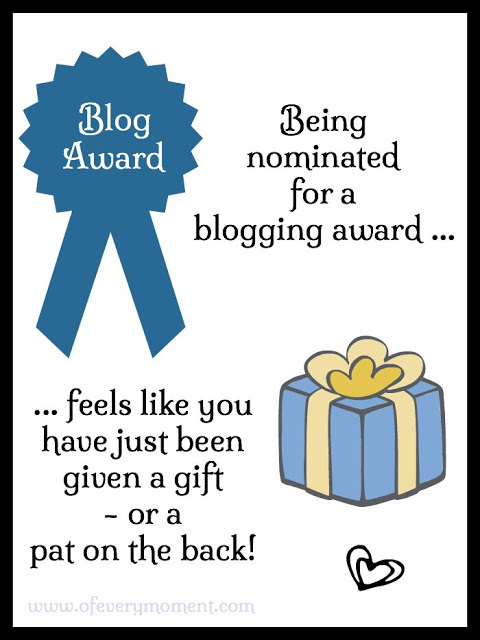 I did find some fun links, however, to share with you this week. I hope you enjoy them! You might remember that in one of my posts back in January, I shared a link for a wonderful recipe for Banana Jam. Well, just in time for the holidays, I came across this recipe for Cranberry Jam. I bet it is wonderful on toasted English muffins! Just when we think we have a healthy diet figured out, research suggests something different. This study seems to make a lot of sense, but it just doesn't seem fair that something that is so good for us could also cause harm. The latest study about antioxidants is terrifying. Halloween this year falls on a Saturday. I suspect there will be even more parties and festivities this year, than in a year when Halloween is on a weekday. Do you have a costume yet? If not, this link might be helpful - 22 costume ideas you can quickly create! When I was in elementary school, we would save our gum wrappers and make long chains out of them. The guy in this commercial used them in a different way. Very creative (not to mention romantic), don't you think? Don't forget, when you change your clocks, it is a good idea to also change the batteries in all of your smoke detectors! Which of these links did you like the best? I was tired yesterday. Maybe it was from getting up early to exercise, or going to bed too late, or perhaps even just some mental exhaustion from thinking about my list of chores that need to get done. In any event, I worked hard all day, and by 5:30 pm I was dragging. I wanted to make pasta for dinner, but I didn't feel like preparing a homemade spaghetti sauce from scratch. Rather than just heat up store-bought sauce out of a jar, (which I personally don't really like) I made my shortcut version of "sort-of-homemade" spaghetti sauce. This version involves browning ground beef and garlic, adding some veggies, and a jar of whatever brand of spaghetti sauce that I have on hand (usually a roasted garlic or basil and roasted tomato flavored one). Yesterday though, the jar of spaghetti sauce presented quite an obstacle. So much for minimal effort in preparing the sauce. When I tried to open the lid on the spaghetti jar, it wouldn't budge. I have pretty strong hands, and usually jars don't present any problem. The diameter of this one was large enough that I had some trouble getting a good grip, and it was STUCK. I tried all the tricks that I knew - using a rubber mat for more traction on the lid, tapping the jar lid on a hard surface, and running it under hot water - all to no avail. I suddenly knew just how frustrating and limiting a physical challenge like this can be. Fatigue was definitely interfering with my coping skills; I began to feel very overwhelmed and started wondering what on earth I was going to make for dinner! Fortunately, right about then, after a lengthy time of being held under hot water, I was able to use a damp washcloth to help twist the lid and open the jar. In those few frustrating moments before the jar opened, I gained a true appreciation of how much I take for granted the skills I have to perform simple everyday activities. I did get the sauce made, and it was good. I'm sharing the recipe here, you might find it helpful the next time you are pressed for time and lacking energy when it is time to get dinner ready. This sauce over pasta and served with a salad is a satisfying dinner - very quick and easy to prepare. Unless, of course, the lid to the spaghetti sauce jar is stuck! 1 can sliced mushrooms, 8 oz. 1 jar storebought spaghetti sauce, 28 oz. 1. Lightly spray a deep frying pan with cooking spray. Brown ground beef with minced garlic until no pink remains, stirring to crumble the meat. 2. Add mushrooms tomatoes, salt and herbs, and full jar of spaghetti sauce. 3. Simmer for at 30 minutes. If too acidic tasting, add a little brown sugar while cooking. Note: If you are feeling ambitious, you can also add chopped onion and/or chopped pepper when sauteing the meat, use fresh mushrooms instead of canned, and sometimes I add a splash of red wine. What is your favorite shortcut for preparing a quick meal? 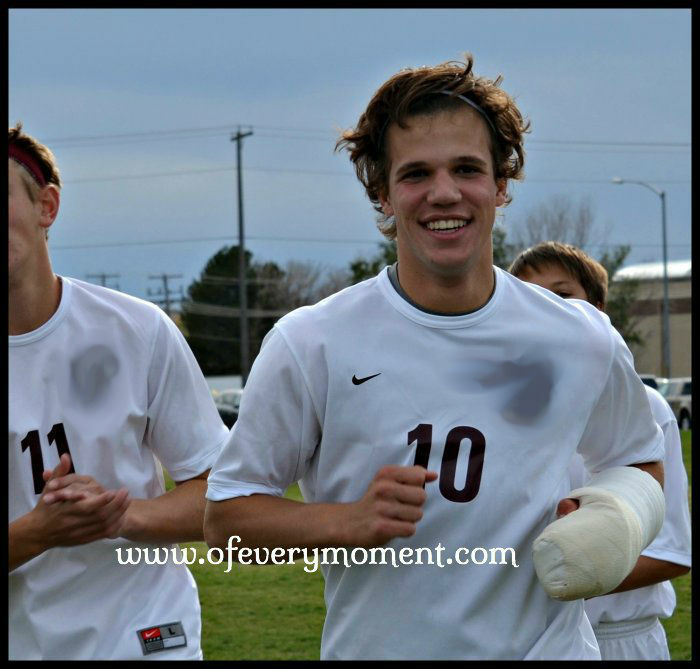 This time last year I shared an essay I wrote about the abrupt end to my son's high school soccer season. Going into the playoff game, his team was in second place in their Division, but then they lost to the last place team. This knocked them out of the competition, and suddenly all of our plans to watch them try to win the State Championship evaporated. Hotel reservations had to be cancelled, and players, coaches, parents and fans all felt quite bereft. This year, the Montana State High School Association changed the rules. The top two teams from the season get an automatic berth at the Montana State Championship meet - so we were able to avoid the trauma of a play-off game. My post of Fabulous Finds yesterday was quite long, so today I am simply sharing a few photos of the beautiful fall days we have been enjoying this week. Our weather has been truly spectacular. I would love another month of days like this! Wishing you beautiful days and a very happy weekend! See you here again next Tuesday. What is your weekend forecast? Did you know that today is National Mole Day? What is a "mole" and why celebrate it? In addition to being a furry animal that lives underground, a "mole" is a basic unit of measurement in chemistry: Avogadro's Number (6.02 x 1023) I know that I learned about Avogadro's Number when I was in high school; in fact I remember using it quite a bit. I do not, however, remember ever celebrating it! In the more recent past, "Mole Day" began as a way make chemistry more exciting, and it is celebrated every year between 6:02 am and 6:02 pm on October 23rd. My son's chemistry teacher has invited all her students to arrive at school at 6:02 tomorrow morning, with "mole" related foods. My first "fabulous find" of this week has to do with Mole Day - and then there are some pretty fabulous other things as well. Susan's Chocolate-Banana Bundt Cake - So Easy and So Good! I have just realized a major disadvantage to the “empty nest.” When my youngest child goes off to college, I will be baking for less people. I love to bake, but I have a sweet tooth and it is best when there is only a small amount of cookies, bars, pies, or cake available for me to consume! Knowing that soon I will not be hosting teenagers as often, I am trying to take advantage of each time my son has a group of friends over. It is the perfect situation: I get to enjoy baking, and whatever treat I make will be pretty well gobbled up - instead of being leftover to tempt me! A few weeks ago, I knew a group of teenagers would be arriving at our house in a few hours. It was a busy day, and I didn’t have a lot of time. Cookies were too labor intensive - I needed something I could mix up quickly and pop in the oven. I decided to make a bundt cake from a cake mix. My favorite bundt cake recipe was written down for me by a friend years ago, after I begged her for the recipe of the cake she had just served me! One of the ingredients is a large box of instant chocolate pudding. Searching the shelves of my pantry, I realized the only flavor of instant pudding that I had on hand was Banana Cream Pie. Using the banana flavored pudding gave me an idea of a way to make the recipe just a little more healthy. I had some very ripe bananas, so I mashed one up and substituted it for one of the 4 eggs listed on the original recipe. Once the cake was baked and cooled, I decided to glaze it with a banana-chocolate glaze and then sprinkled it with a little confectioners sugar. The cake quickly disappeared, but the next time I have ripe bananas I might just have to make another one! 1. In a mixing bowl, stir until combined: cake mix, instant pudding, eggs, mashed banana, oil and water. Beat on medium for 2 minutes until well blended. 2. Fold in greek yogurt (or sour cream) and chocolate chips. 3. Pour mixture (it will be thick) evenly into prepared pan. 4. Bake in preheated (350 degree F.) oven for 50 - 60 minutes, until tester comes out clean and cake is pulling away from sides of pan. 6. Serve plain, or top with glaze and/ or a dusting of confectioners sugar. 1. Whisk all ingredients, gradually adding confectioners sugar, until glaze is still thick but a consistency that can easily be poured in a stream over the cake. 2. Pour a thin stream of glaze back and forth around cake, so it drizzles down both the inside and the outside. Try to pour near the top of the cake, so only a minimal amount of glaze drips off before it hardens. 3. Once glaze has set, I like to lightly dust the entire cake with confectioners sugar. Did you notice my moose napkin rings? I guess in Montana, you really never do know when you will come across a moose! What is your favorite version of chocolate cake? We just returned home after a couple of days in Kalispell, MT. The weather was picture perfect, we watched some really good high school soccer games, and enjoyed the beauty of Montana. Did you know that you can finish ripening tomatoes in your garage? Our growing season is short in Montana, but this year I figured out how to give my tomatoes a little bit more time to finish getting ripe. It worked! This tomato was every bit as flavorful as it looks! I used to be skeptical of this method. Several years ago, I heard that it is possible to finish ripening your green tomatoes by hanging the tomato plants upside down inside, before the first hard frost. I could never quite figure out the logistics though - how to pick up the huge plant and move it inside, what to hang it from, etc. In past years, I used other ways to ripen my tomatoes instead. There are a number of ways you can ripen end-of-season tomatoes after the weather becomes too cold for them, and I have tried many of them. For example, here are three different things I have tried. One year, when I grew cherry tomatoes in a pot, I brought the entire pot inside, put it by a sunny window, and continued to water it. Tomato plants are not the most appealing house plant - but we were picking cherry tomatoes for our salads all the way into mid-November! I covered the tomato plants with thick blankets every frosty night, and let them get sunshine during the day, prolonging the life cycle of the plants outside for as many days as I could. I picked all of the tomatoes off the vine. I let the ones that had begun to turn red finish ripening on my windowsill, and wrapped all the green ones in newspaper. I carefully placed the wrapped tomatoes one layer deep in cardboard boxes. I stored the boxes in my cool dark basement, and most of the tomatoes did ripened after a few weeks. The were good enough - but not great. This year I uprooted and brought the whole plant inside - the easy way! Nearly two weeks ago, our weather turned and we had frost in the forecast. I really only had one plant still laden with unripe tomatoes, but we had really been looking forward to eating them. On a whim, I gently pulled the entire plant up out of the ground, and wrapped a plastic bag around the still dirt-covered roots. Carefully supporting the stems and tomatoes, I carried the entire thing into our garage, and looked around. What to do with it?? There really wasn't an ideal place to hang the plant upside down, and I didn't have much time to deal with it. I placed the bag of roots in a shallow box, propped that up on another taller container, and let the tomatoes trail downward onto the ground in an out-of-the-way area of our garage. I didn't hang the tomato plant completely upside down - I just balanced it so the roots were higher than the stem. This seemed to work well, and was really easy to do. I then proceeded to ignore it. My results, after a little over a week. Today, I took a look. ALL of the tomatoes ripened perfectly, and we will be enjoying every one. Once I pick them, all I have to do is wrap the rest of the plant up in the garbage bag, and take it to the transfer station where we take our trash, to be recycled. This was the easiest and best way I have ever dealt with our end-of-season crop of tomatoes. Maybe it will work for you! We ate this garage-ripened tomato last night, and it tasted just like it had been ripened by the sun! What tips do you have for growing, ripening, and harvesting home-grown tomatoes? This week's List of Fabulous Finds is all about "how to do" things. In less than a year, my youngest child heads off to college. I have been thinking a lot lately about whether or not I have taught him well enough "how to do" all the things he will need to know. I worry less about whether or not I've taught my kids enough, when I think about the wealth of information at our fingertips today. The Internet is a powerful resource. The following links are good examples that the Internet provides information on how to do just about anything. A button fell off one of my son's dress shirts this week. I've shown both my kids how to sew a button back on, but this in not a skill that is regularly practiced. Wondering if help would be available, I searched on-line and sure enough, found a video that gives even better directions for this task than I ever could. Words for Wednesday was a meme originally created by Delores of Under the Porch Light. She used this weekly writing prompt to encouraged others to write something creative. When she could no longer continue to host it, Elephant’s Child took over for a while, and then organized volunteers to share the responsibility. Drifting through Life hosted in July, Randomosity in August. 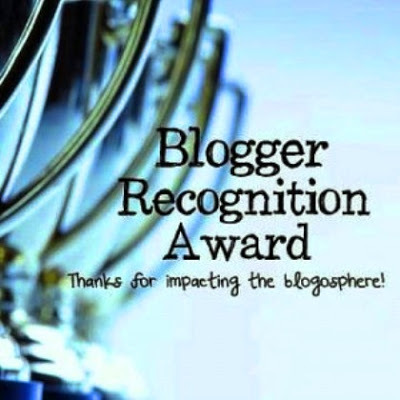 During September the challenge was posted here, and now October's prompts will be created by Margaret Adamson and her friend Sue, but published on the blog Elephant's Child. 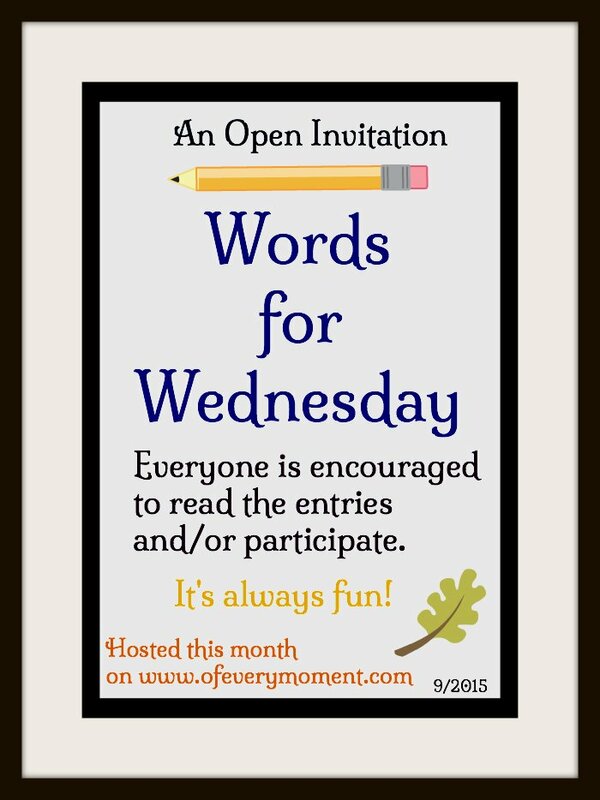 Today, I am continuing the fiction story I have been writing using the Words for Wednesday word prompts from last week. Mindy was working hard to finish putting the rest of the photos she had printed into a sparkle-covered album. She had purchased this particular scrapbook (with glittery hearts across the front) because she had wanted a romantic place to keep all of her photos from time spent with Ryan. It had been almost a year since they had begun dating, and the album was nearly full. Mindy hadn't seen much of Ryan for about a week. He was really busy with his new job, working for a new builder in town. It had been hard for him to give up his own business, but he said he preferred the regular income to the independence of having his own handy-man business. The full-tiime hours, on top of still going to classes part-time, and trying to attend to the needs of his parents, just hadn't left him much free time. Earlier in the week, Mark (Ryan's dad) had climbed a ladder to replace a bulb in a sconce on the wall above a stairwell. One of the ladder rungs had given way, and he had slipped and taken a bad fall. Home alone, Mark had been able to crawl to the phone and dialed 911, but then became too out-of-breath to speak. It had been a good thing his parents still had a land line - the ambulance, as per protocol, was dispatched to his address and help arrived. Had Mark called from a cell phone, it might not have been so easy for the paramedics to locate him. Although aways completely independent, Ryan's parents suddenly needed quite a bit of help from their son. With four broken ribs and a recently collapsed lung, Mark needed assistance with basic activities-of-daily-living, and couldn't do any of the household tasks he usually did. Ryan was trying to be there to help his mom as much as possible. Mindy had wanted to help too, but she didn't want Ryan' parents to contract the miserable head cold she had been suffering from for most of the week. Ultimately, she had realized the best thing she could do would to be to stay away from them! There was one thing she had been able to do for them, though. Ryan's parents had a pet bunny, still living even after all their children had left home. Ryan's mom was allergic to it, and it had always been cared for by Ryan's dad. When Mindy found that out, she had offered to keep it at her house until Mark could take care of it again. Ryan had brought the hutch, the rabbit, and all it's supplies to her house in his truck. She rather liked having a fluffy little furry friend in her home, although it made her nervous to take care of someone else's pet. More than once, she had called the vet to inquire if its eating habits and behaviors were normal for a pet rabbit! With just a handful of photos left to place in the album, Mindy stopped to admire a few. 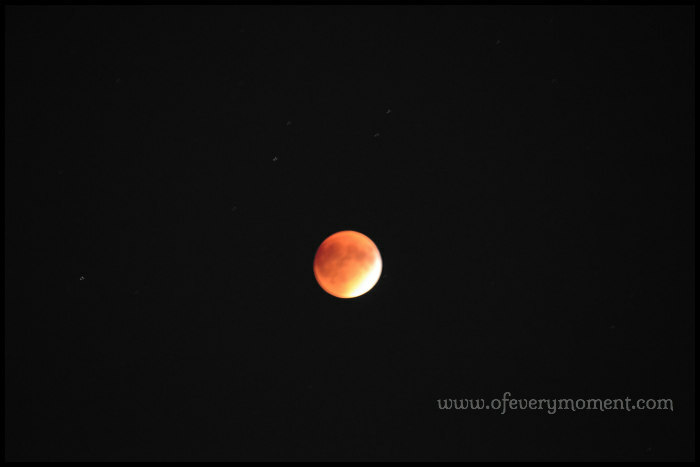 Her camera had done such a good job of capturing the "super moon" during it's eclipse on September 27th. Mindy reminisced about how lovingly Ryan had hugged her as they gazed up at the night sky. He had remarked that they would only have to wait 18 years to see the next super moon lunar eclipse together - in 2033! She had been so sure his comment had been the lead-in to a proposal. Now she felt a little ashamed of how grouchy she had been for the rest of that evening, when she realized Ryan was not planning to propose that night. 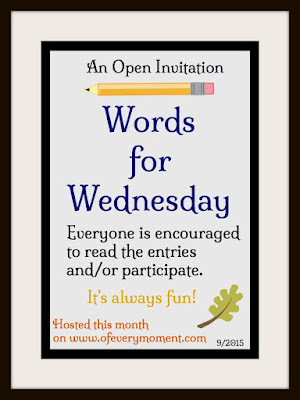 Don't forget to visit Elephant's Child today, to see the Words for Wednesday Word prompt for this week! Are you as surprised as Mindy that Ryan hasn't proposed? Do you think she should talk with him about her hopes for the future, or just wait and hope that he will propose?